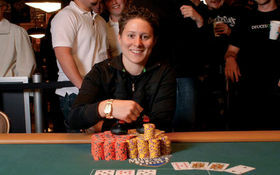 For the second straight year Vanessa Selbst has found her way to the final table of the PokerStars NAPT Mohegan Sun final table. The Team PokerStars Pro will enter the final table second in chips, trailing only Tyler Kenney as she continues her quest to repeat as the NAPT Mohegan Sun champion. Joining Selbst at the final table is another former NAPT winner –at the 2010 Los Angeles Main Event– Joe Tehan. Tehan will enter the final table in the middle of the pack in terms of chips. Yet another familiar name to poker fans at the final table is Dan Shak, the former hedge fund manager turned poker player. Selbst won $750,000 for her victory last year, but after a huge drop in attendance –from 716 down to 387 this time around—first place prize-money has dropped to $450,000, with each player guaranteed at least $32,330 for an 8th place finish. This entry was posted on Wednesday, April 13th, 2011 at 11:29 am and is filed under Poker News. You can follow any responses to this entry through the RSS 2.0 feed. You can leave a response, or trackback from your own site.